Dominique Morisseau knows the city of Detroit, its people, and their history of being exploited. The MacArthur Fellows' "genius grant" recipient has written a trilogy of plays covering key moments in the city's demise. (We have covered the political and economic forces behind this history here.) 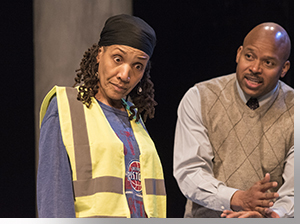 Last year, Curious Theatre company produced the first part of the triptych, Detroit '67. Skeleton Crew is the third in the series. Morisseau captures all this using one location, the factory workers' multipurpose break room/locker room in a stamping plant. The superstructure of the facility can be seen around the perimeter of Charles Dean Packard's gritty, industrial set, replete with fluroscent fixtures and steel lockers. Across the top, we see what appears as an art noveau mural of workers, with hints of Diego Rivera's work. Between scenes, sound and projection designer El Armstrong's animation sequences comment on automated production lines and the effect of their mechanical repetition on human existence, much like Chaplin's famous caught-in-the-gears scene in Modern Times. 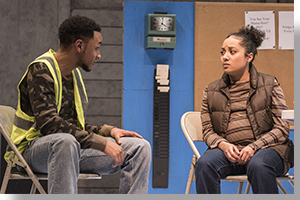 A production supervisor, Reggie (Cajardo Lindsey), two young workers, Shanita (Kristina Fountaine) and Dez (Quinn Marchman), and a union rep, Faye (Perri Gaffney), traffic through the premises at all hours, reeling from mandatory overtime and various pressures being exacted on their daily lives by the 2008 intentionally orchestrated economic crash and increasing lawlessness on the streets and at work. Reggie worked his way up from the line, and must now enforce management's dictates, which become increasingly more invasive as production materials are stolen nearly every evening; Dez is saving any extra money he can scrape together to open his own shop; Shanita is pregnant and the father of her child has left the scene; and, Faye has less than a year to go to get her long-promised and well-earned pension. Director donni l. betts works magic with pitch perfect casting and primo performances. 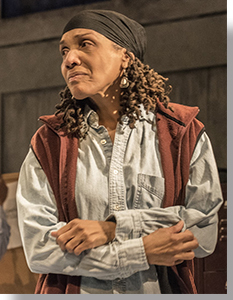 Gaffney, as the wizened union rep, Faye, is a wonder, brimming with empowerment, as if she owned the joint; and, arguably, she does in her own way, as we discover. Faye was best friends with Reggie's now-deceased mother; it's a family tie that binds them. 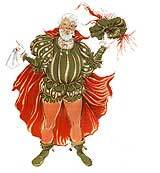 As the story progresses, this becomes the key relationship in the resolution of the drama. To Faye, Reggie is like a son, even if she mostly hides this attachment from him, to provide Reggie the space he needs to be a shop supervisor for management. Lindsey masterfully flows through the entire spectrum of this dynamic—respect toward his mother's best friend and the exercise of his supervisory responsibilities—without missing a beat, when Shanita and Dez show up. Marchman's brash Dez is a force of nature, unpredictable to others, but consistent to his own worldview. Fountaine's synthesis of single-mother-to-be brave face and pregnant vulnerability is a sublime gestalt. Morisseau weaves a lovely arc for these two coming to understand one another! Lighting (Richard Devin), music (James Key), and costumes (Linda Morken) underscore mood atmospherics. Detroit then is the U.S. today, with its large swaths of third-world conditions—broken cities, homeless masses, increased surveillance, and police encroachment on human rights. 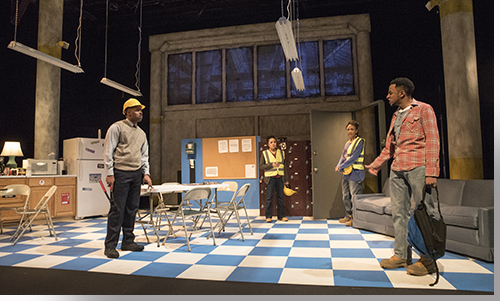 Curious Theatre Company's regional premiere of Dominique Morisseau's Skeleton Crew, directed by donnie l. betts, runs through April 13th. For tickets: curioustheatre.org/event/skeleton-crew.